Photo by Kami April 2010. 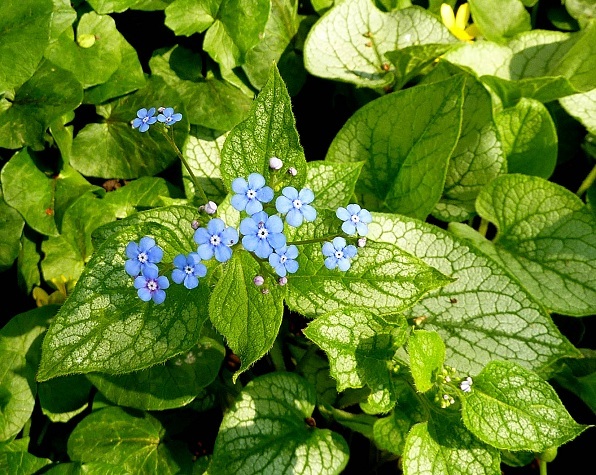 In the wild, Brunnera grows in reasonably moist, deciduous woodlands. In the garden, they prefer dappled shade and humus-rich soil. In cooler regions they can tolerate morning sun if the soil remains reasonably moist. In early-mid spring plants produce wiry stems topped with open clusters of blue or rarely white, ‘forget-me-not’ like flowers. At this stage the leaves are still quite small. After blooming, the rounded to heart-shaped leaves increase significantly in size to reach upwards of a foot across. If well grown, these plants can assume the role of a groundcover in shady areas.